Harry Potter and the Goblet of Fire is the first in its series to truly delve into darker themes and atmosphere. 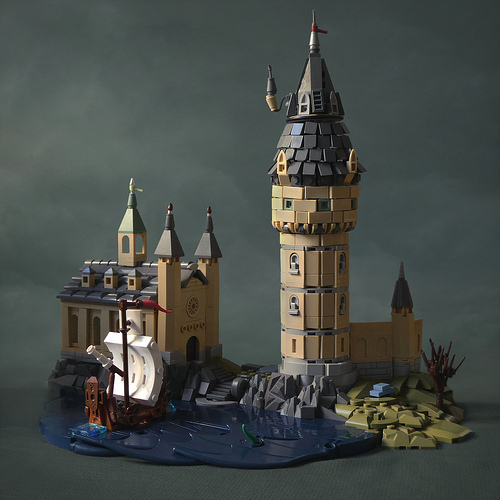 It seems this mysterious and gloomy tome is what inspired Simon NH to build his latest creation, a microscale scene of the Durmstrang ship’s arrival at Hogwarts School of Witchcraft & Wizardry. It seems Simon has a phobia for normal bricks, as there are hardly any throughout the build. There are a few used as the lake and some plates visible here and there, but everything else is built from “specialized” parts and more or less exotic tiles and slopes. Of course, the inner construction probably has a lot of basic bricks, but here the looks are probably the most important. The best details have to be the tower’s roof and the wings used as waves. It is not all just in the cool parts used and in the combinations of bricks most people would never think to put together; a big impact is made by the lighting, photography and the subtle background added in post-production. I can almost hear the wind howling and waves crashing!